Net Weight: Packet (240 seeds)1/4lb (100000 seeds)(+$7)1lb (400000 seeds) (+$14) This item is currently out of stock! This variety of Fescue grow in upright tufts rather than spreading like lawn grass. Produces silvery blue mounds of fine leaves that make an attractive addition to any garden or that can be used alone in low maintenance landscapes. 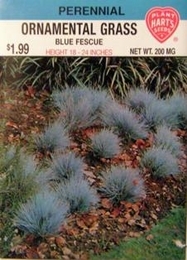 Widely adapted, blue fescue will tolerate poor soil, dry conditions, low fertility and salt air, but will thrive in garden situations. Attractive as specimen plants surrounded by wood chip mulch. Thinning - when plants are 2-4 inches tall thin to 12 inches apart.